The Long List Anthology ebook is on sale this week for 99 cents (or similar price in other currencies). It was a featured deal in BookBub’s daily email on Sunday, and will be on sale at least through end of day Thursday (Pacific time). Links to vendors can be found at Diabolical Plots. 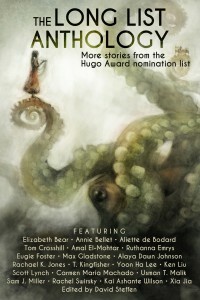 The anthology presents many of the short fiction works which were not 2015 Hugo finalists but received numerous nominating votes. This entry was posted in Like Show Business and tagged David Steffen by Mike Glyer. Bookmark the permalink. I’m very excited for how well this is selling. Yesterday I had a delightful chat with David Steffen about my thoughts for this becoming a continuing series and my ideas for a 5-year plan. He’s very thoughtful, committed to authors, and happy to see them getting so much attention. David stepped up to the plate and should be proud of what he accomplished this year. 7,000 is a great number considering it’s a short fiction reprint anthology with no marketing budget. David deserves a lot of credit for his efforts. Oh wow, Amazon.co.uk sales rank is 261. Must be selling like hot cakes at the moment. I’ve bought a copy and passed the news on FB. I wonder how high on the chart it will go? ETA: currently #93 on Amazon in the US. I had literally just come over here to share this news on the latest Scroll. At least I can add the explicit verification that it’s on sale and DRM-free at Kobo. I can add verification that it’s also on sale at B&N. Honest to Ghu, “When It Ends, He Catches Her” is worth 99 cents all by itself. I know, right? It’s a damn shame we lost Eugie so early. Rev. Bob: That should have won. Not just for Eugie, but for perfection. I read it again yesterday and I found something I hadn’t seen in my 3-4 previous readings. Even the title has at least two meanings. Tasha: How come no availability on Google Play? I’ve never even heard of some of the platforms it is on, yet it’s not on a platform that everyone with a Google product has installed automatically! Phones, tablets, Chromebooks, it’s the touch of a button. It’s my preferred place to buy and the only place hubby buys books for his phone and tablet. Bought this and dove right in. I hope it becomes a regular thing. I’m just someone* who talks to David Steffen occasionally and gave him some advice on the Kickstarter after it was up and running. I’m not officially associated with the Long List Anthology in any way. I’m pushing (but not pressuring him) for it to be a regular yearly anthology as I think it would be a great way to honor more authors and I think there is an interest beyond what SP/RP did this year. That said I’ve heard a lot of strange things about Google Play from indies. I’m addition to what Rev Bob says I’d personally have reservations with putting my work there until all the various issues have been straighten out. In my day job, I maintain the website for a decently small game company. This makes me more of a tool of the marketing department than much else, but I have to keep a sharp eye out for proofreading errors and similarly nitpicky things. After hours (in more than one sense), I make indie ebooks – editing, formatting, a little cover work, and so on – and help with the technical aspects of publishing them. That covers a range of little things like negotiating the Kindle/Smashwords submission process, putting the title up on Goodreads, helping with blog code, stuff like that. I guess that technically makes me part of the publishing industry, but it doesn’t really feel like it. I don’t get any perks out of it, aside from early looks at the material I’m working on… much like an alpha or beta reader. See you work in the biz. I give unsolicited advice on other people’s blogs, Kickstarters, and elsewhere online. I’m no longer able to do even freelance work unless someone wants a few hours on the phone and it’s been over a year since someone paid for that. Technically I do own a business teaching social media to authors/creative types but due to health I can’t do much of what I’d like to offer (or my website may still claim I offer). The main piece is to create a personalized plan for each client. Something I currently can’t do. I can walk them through filling in the template and creating their own plan. Which is more effective for them but few people want to do the work – that’s why they hire someone. I consulted on the setup of 2 small publishing firms. One went out of business in under a year. The other handles a single author I believe. Once upon a time I was very good at writing business plans now I don’t have the energy to be reliable. Neither went in the direction the plans called for. The second one because the money wasn’t there. Pretty funny if you consider I’ve never worked at a publishing firm. Wow I sound like Debbie Downer today. LOL I can outdo you on being a nobody dang it yes I can. Or maybe I should quit where I’m at. Even though this e-book is not connected with me in any way, I wish it, the authors in it, and the publishers well.